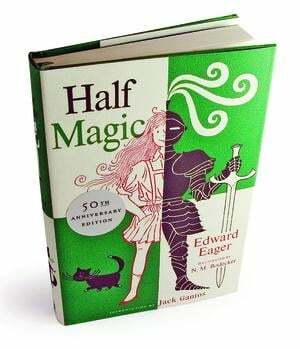 This book was written in the 1950s and takes place in England 30 years before that, but because magic (even half magic) is timeless, the story doesn't seem out of date. "Half Magic" is about four children who are completely bummed because they don't get to go to the beach or the country during the summer. They must stay in the city with a surly babysitter while their mom works. One way in which this book shows its age is that there are no video games to keep Jane, Katharine, Mark and Martha busy. So the kids entertain themselves by going to the movies, playing make-believe games and going to the library. It is on the way to the library on an early summer day that Jane, the oldest of the four, finds a glittering coin on the ground. Later that day, hot and tired and bored, the children sit to rest. Jane, in frustration, wishes for a fire. Suddenly the children hear fire engines, see smoke and realize that a small children's playhouse in a neighbor's yard is spouting flames. So the question is: Did Jane cause the fire or was it just coincidence? The coin Jane found holds the answer, for it grants wishes - of a sort. Half wishes. Jane had actually wished that the house of a mean neighbor would catch fire. The coin granted half of her wish, setting the playhouse on fire. As the kids take turns making wishes, they realize that figuring out how to word their wish precisely is half the fun and half the adventure. After you've read this book, you'll have a new appreciation for the old saying "Be careful what you wish for!"